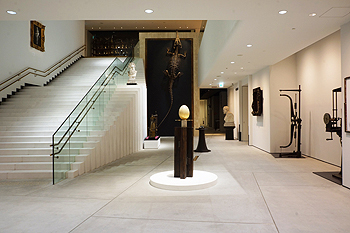 Intermediatheque (IMT) located next to the recently restored Tokyo Station oozes with seductive appeal to those tired of traditional Tokyo museums. A public institution jointly operated by Japan Post and the University Museum of the University of Tokyo (UMUT), IMT is an intellectual hub of research and researchers headed by Professor Nishino Yoshiaki. The Sainsbury Institute had the pleasure of working with Professor Nishino when IMT was in its previous guise as the University Museum, the University of Tokyo (UMUT) on a special seminar to explore a wider discourse on university museums back in October 2012. Since then, UMUT has joined forces with Japan Post to create Intermediatheque (IMT) that would be housed in the latter’s historic building – JP Tower – in Marunouchi area. IMT builds its success on its outstanding archive collection that dates back to the 19th century when the University of Tokyo was known as one of the Imperial Universities. Its rich heritage is reflected in its considered design. The aesthetically polished rooms in the Showa era modernist architecture feel as though the clock has stood silent for 300 years. That is not to say that academic rigour took the same relaxed pace. 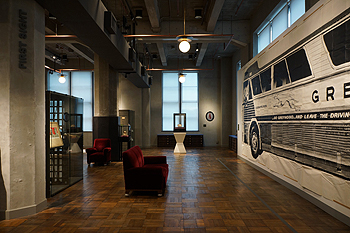 In fact, IMT features highly on the radar of museum studies specialists as an innovative institution that produces excellent research and public engagement programmes while cultivating unique funding stream through partnerships with other institutions including major business corporations. In this issue, we asked IMT Director Professor Nishino Yoshiaki on the intriguing history, heritage, activities and future plans of IMT. Sainsbury Institute: Intermediatheque (IMT) is a very young institution since its establishment in 2013. The partnership between Japan Post and the University Museum of the University of Tokyo helps explain IMT residing in Tokyo Central Post Office’s five-storied historical building. But the link between Japan Post and Japan’s most revered university is less obvious. Why in the first place did you leave the university campus, how did the partnership with a private company come about? 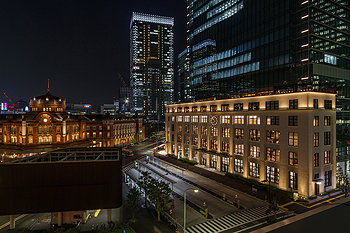 Nishino Yoshiaki: I think it was around 2008 when we were broached with the project to build a 200 meter tall office block on the site of the former Tokyo Central Post Office in Marunouchi just outside Tokyo Station. The new building would symbolise the dawn of a new era for Japan Post Co., which would turn the state-owned Postal Service into a privatized enterprise as part of the Ministry of Posts and Telecommunications reform measures. To push the development forward, the project called for a public service facility to be installed on one of the lower floors of the building. That is when the University Museum, the University of Tokyo (UMUT) was approached. I was later told that the individuals responsible from Japan Post had seen and took great interest in our exhibitions at UMUT where I was then the director. Marunouchi is known as a key business district in Japan where major company offices cram the ground between the Imperial Palace and Tokyo Station. The area pulsates with commercial vigour, but little in the way of cultural and scientific excitement. One might dismiss this as normal as historically Marunouchi district was never purposed as a base for cultural promotion. But equally, there was no reason to stop culture to flourish together with commerce. For this reason, establishing a ‘Hall of Academia’ in the heart of the business district seemed to be an incredibly appealing project. Its location was ideal. Tokyo Station is the main gateway to the rest of Japan where people from in, around and afar from Tokyo intersect. The area is also a day home to the hundreds of thousands of office workers. The idea was to create a ‘relaxation and healing space’ where scholastic fun and discovery could easily be enjoyed. For this purpose, the partnership between Japan Post and the University of Tokyo was ideal. However, this turned into a rather complex project in terms of its administration. As some of you may know, the University of Tokyo was under the remit of the Ministry of Education, Culture, Sports, Science and Technology prior to becoming a quango. Meanwhile, Japan Post was the offspring of the former Ministry for Posts and Telecommunications. In effect the project was the brainchild of two ministries. It takes little imagination to consider the tribulations involved in an arranged marriage between two ministries. Without a precedent the project experienced its share of challenges. Sainsbury Institute: IMT focuses on interdisciplinary and experimental activities. This includes housing a permanent exhibition in the JP Tower in Marunouchi district displaying scientific and cultural heritage resources amassed by the University of Tokyo since its founding in 1877. This is complemented by research, educational and artistic endeavors that explore the connection between historical and contemporary urban landscapes. Could you please tell us more about your collection and your unique strategy that allows you to engage with a wide range of public audience? Nishino Yoshiaki: As evident in web-based social network services, platforms offering free-access have demonstrated their high social and economic value in contemporary society. People would gather in these free spaces to form a critical mass to create a ‘hot-spot’. Being a free service, they act as a kind of a magnetic field to attract more individuals and businesses. The non-initiated would soon find it difficult to resist the temptation of not joining the hot-spot community. From a promotional point of view, sites such as these are the most cost effective means to promote activities. Following this model, museums should also be a hot-spot, particularly in the realms of encouraging culture, education and innovation. One of the benefits of being a free hot-spot is the confidence and assurance it gives to individuals and corporations who may wish to support the organization. IMT insisted from the very beginning to be a free-entry facility. 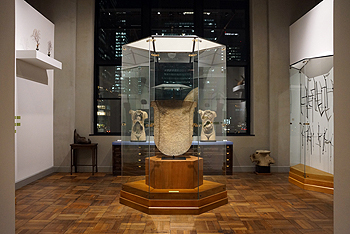 IMT’s collection, which is mainly comprised of objects from the University of Tokyo’s scientific research archive, was essentially built with tax-payers’ money. It would therefore make little sense to double-charge the public unnecessarily in order to display the objects begotten with their contribution. It is also true that being a non-profit organization makes it easier to receive donations and gifts of important collections from scholars and philanthropists. Rather than relying on a budget based on entry-fees, I felt that it is more effective to develop IMT as a cultural and academic hot spot in order to solicit large corporate sponsorships without compromising IMT’s educational and research standard. I could not for sure say how long IMT can carry on with this business model. But it is encouraging to see for example that, we—the University Museum, the University of Tokyo (UMUT)—continue to operate as a free-entry museum for well over twenty years with no imminent plan to change this policy. Both IMT and UMUT highlight the importance of being free, open access and as a result, ‘hot’. IMT has welcomed nearly a million visitors in its first year since opening in 2012. To remain hot and relevant in the public’s gaze is no easy task. The museum’s wit, innovation and ingenuity continue to be tested. Sainsbury Institute: Your special exhibitions have explored a wide range of subjects from pharmacology, mode and science, and evolutionary biology (and my personal favorite) seen in “Anonymous Penguin”, just to name a few. Upcoming exhibitions include currencies used in some African tribes and the contemporary influence of celebrated figures from Albert Einstein to Marilyn Monroe. What next and what is your vision for this extremely unique museum? Nishino Yoshiaki: Just as there is not a magician who would spoil his trick before his performance, I cannot dampen your anticipation by disclosing our future plans. Having said that, our fundamental project strategy is very clear. 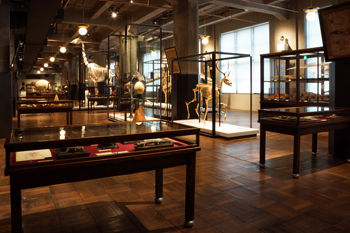 We maximize each project by utilizing objects in the vast University of Tokyo’s scientific specimen collection and conversely borrow as few objects as possible from other institutions. We decline all offers to host third-party designed exhibitions. What we do is to develop our own projects, design our own exhibitions and display to the public the scientific material resources that are already available to us. That is, we ‘reactivate’ scientific specimens that are rarely shown to the public. We try to re-up-cycle, re-design and create a bricolage of scientific experiment tools and objects, and architectural pieces that form part of our resource collection. This philosophy is best reflected in the strapline of one of our opening exhibitions, ‘Made in UMUT’. I feel that it is essential to utilize and reutilize our existing resources in an environment where energy and resource consumption remains high on the agenda. We have followed this philosophy up until now and hope to carry on in this spirit with our future activities. Museums in all parts of the world, and particularly in Western developed countries, host a wide range of special exhibitions. One observation though is that most of these exhibitions tend to demonstrate our contemporary interpretation or ‘knowledge’ about particular subjects in a fragmented and divided way, whether it be on art, architecture, archaeology, history, natural history, industrial heritage, science, medicine or literature. However, if you trace the origin of what we call museums today, in the pre-modern period, they were made up of uncategorised assemblage of objects collected from around the world and presented as ‘cabinets of curiosity’ or ‘chambers of wonder’. I am interested in shifting the focus back on the objects themselves and the appreciation of these material cultures through creating exhibitions that convey the essence of the original museum landscape. The act of collecting, whether it is to show the collection to others or for personal enjoyment, demonstrate how we humans gaze the world, which inform our outlook on the world. My goal is to stage a ‘Theatre of the World’ through the display of objects, a practice perhaps difficult to categorise within our contemporary vocabulary. Sainsbury Institute: The current buzzword in many of the academic disciplines is ‘globalisation’ and how this is achieved is also a concern for Japanese cultural and educational institutions. Your museum has galvanised relationships with many international organizations. Could you tell us some memorable collaborative projects IMT embarked on, and how you hope to strengthen your global reach? Nishino Yoshiaki: Since launching the ‘Mobile Museum’ project in 2007, we have exhibited over 100 times in Japan and 13 other countries. These include Taiwan, China, Philippine, Laos, and Mongolia in East Asia, Syria, Ethiopia, and Morocco in the Middle-East and Africa, France and Italy in Europe, and Peru in Latin America. In the next coming years, we plan to extend this overseas network to include the UK, Azerbaijan, Switzerland and Sweden. A number of exhibitions are still ongoing on a rolling basis in the partner countries with contents periodically updated. There is also an established network of Mobile Museum partners in Japan. The ideal structure would be to develop exhibition contents that can be rotated and exhibited in all national and international partner institutions on a mid- to long-term basis. This goes back to my belief that ‘scientific specimens’ embody a universal value. The objects can be appreciated by people irrespective of cultural and historical boundaries in our contemporary trans-ethnic and transnational communities. I feel that they are a rare form of ‘universal language’ that many can understand. It is worth mentioning that the mid- to long-term exhibitions we develop and maintain are unique in their design. Rather than be a one-off event, the exhibitions function as spaces for the people. To be more precise, they are the ‘common space’ where the objects are part of the visual lives of the people. The reason to continue producing, maintaining and enhancing ‘mobile exhibitions’ lies in the ability to celebrate the beneficial exchanges between nations, institutions and individuals.